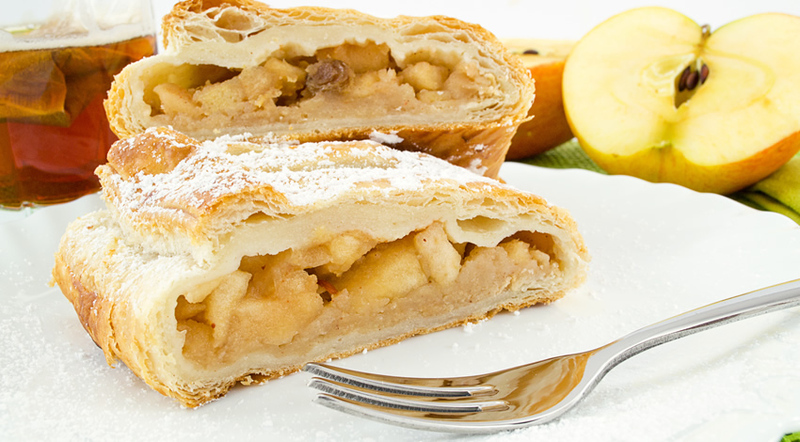 Made popular in the 1700s by the Hapsburg Empire, today apple strudel is considered the national dish of Austria. The oldest strudel recipe on record was handwritten in 1696 and can be found at the Viennese City Library. Preheat oven to 400°F (204°C). On a very lightly floured, plain-weave kitchen towel, lay out puff pastry dough. Lightly flour top and gently roll out to a thin rectangle about 14" x 17", sealing any tears in the dough. Dough will be quite thin; do not overhandle. Set aside, keeping dough on towel. Peel, core and chop apples into small chunks. Toss with sugar, walnuts, raisins, lemon peel and cinnamon. Lightly brush dough with 1/4 of the melted butter. Sprinkle with dry bread crumbs. Add apple mixture in the center of dough, leaving a 1-inch margin around the filling. Fold in 1-inch along three sides of the dough, leaving 1 long side unfolded. Moisten all folded edges and remaining flat dough edge lightly with water. Using the towel to assist you, roll the dough toward the unfolded edge, enclosing the filling. Press gently but firmly on bottom seam and sides to seal. Using the towel as a sling, transfer strudel seam side down to a cookie sheet; gently remove towel. Brush lightly with the remaining melted butter, and prick sparingly along the top with a fork. Bake about 30 minutes or until golden brown. Cut crosswise into 12 pieces and serve warm with vanilla ice cream or a vanilla custard sauce. Let us know how yours tasted in the comments below!! Is there another river cruise dish that you would love to try cooking yourself? Let us know in the comments and we will do our best to provide the recipe! Enter your e-mail address below to receive our special River Cruising email offers!